If you spend a considerable amount of time reading turn-of-the-(twentieth)-century editions of the local papers of Lowell, Massachusetts, you’ll soon come across the name of Samuel P. Hadley, who presided as a Justice for the Lowell Police Court for close to three decades. In fact, I think a few of the people I’ve researched for columns . . . and even genealogy, might have met Justice Hadley in his courtroom once or twice. Justice Hadley was very active in local history too, and was a president of the Lowell Historical Society. Justice Hadley spent a good amount of his later years recording his memories. As the centennial of Abraham Lincoln’s birth approached just over 100 years ago, Lowell’s historical society took note that they knew of just one man who still recalled Lincoln’s visit to Lowell some sixty years before, in 1848. At the time, Hadley was just 16 years old, but already quite interested in politics. He and his family considered themselves democrats, but Hadley recalled being intrigued by the rival Whig party and wanting to know more. Hadley remembered walking up Lowell’s Central Street on September 14, 1848, and pausing when he saw a sheet of white paper, a yard long and two feet wide, with large black block letters inviting passersby to City Hall two days later, on a Saturday evening, to see the Hon. Abraham Lincoln of Illinois. On the evening of September 16, 1848, a pleasant evening as Hadley recalled it, he walked into Lowell from his home in Middlesex Village. As he turned the corner of Carleton and Hovey’s, he realized he was late, and could hear applause and laughter already escaping from the hall. He entered City Hall, and found a seated crowd, listening, entertained, to a man telling a story. Even the ladies in the gallery had joined in the laughter. Hadley noted that many prominent members of the local Whig party, Lincoln’s then-party, were present on the platform. Hadley later learned that the man speaking to the crowd was a young Abraham Lincoln, who would have been less than 40 years old at the time. Hadley described him as a tall man who was dressed in dark clothing and wore a collar turned over a black silk cravat. He noted that the man, who stood well over six feet tall, stooped somewhat and had long arms, that moved animatedly as he spoke. He also noticed Lincoln’s dark complexion and nearly black hair. 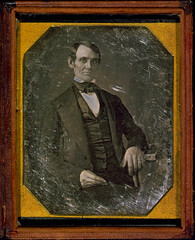 Lincoln’s eyes, he described as bright, humorous, but reflecting a quiet sadness. He found him forceful and candid, rather than eloquent. While Hadley listened to him speak, Lincoln added amusing illustrations to his stories, and had a peculiar way of laughing that included shaking his sides, which caused the audience to laugh even more. He also noted Lincoln’s strange way of pronouncing his words, “in a manner not usual in New England“. Hadley listened to Lincoln for nearly 45 minutes, laughing at his stories. He lamented that he couldn’t recall the details of the stories when he set down to record the memory some 60 years later. Lincoln ended the speech to rounds of applause that filled the hall, and went to take his seat. Before he could sit, though, Mr. Woodman stepped forward, and whispered in Lincoln’s ear. Lincoln needed to stoop to hear Woodman, but nodded and came back to address the audience on the candidacy of General Zachary Taylor as the candidate of the Whig party for the presidency. Justice Hadley finished his recollection, stating that he was fairly certain that Lincoln had stayed in Lowell that Saturday night – since the trains to Boston ran no later than 6:30 in the evening during those days. He did not know where Lincoln had stayed, but speculated that he most likely stayed with the Chairman of the Central Committee, Linus Child, or with another Lowell dignitary, Homer Bartlett, who both lived in the same block on Kirk Street in Lowell’s downtown section.